Susan Waite’s roots run deep here in the Pacific NW as her grandfather was a diamond driller who helped build the Skagit dams. Her grandmother’s parents ran a dairy farm that delivered milk to the dam workers. Her four siblings and she camped and hiked all their summers throughout Washington with their schoolteacher parents. When Susan’s three children were in their teens, she returned to school at Cornish, obtaining a degree in painting and printmaking in 2001. Presently Susan lives in Fremont with her woodworking/fly-fishing partner who builds the finished panels she paints on. Not only does Susan teach painting and printmaking for “Seniors Creating Art” at the Seattle Parks Department and privately in her Ballard studio she also teaches for our students here at Cole Art Studios. 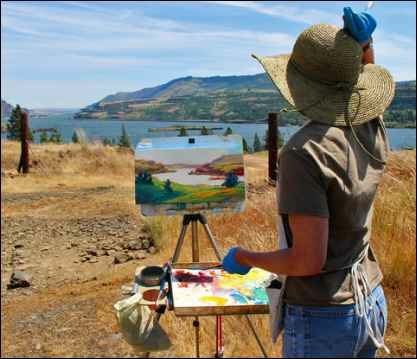 When Susan isn’t teaching you can find her plein air painting or creating unique Home and Garden Portraits on commission. Painting takes me places - and I have always loved being on the go. A great day would be painting along a river with sun and shadows and birdsongs. I love the way light, color and atmosphere play upon everyday objects, neighborhood scenes, and wide open landscapes. I paint to tell these stories. Painting on site and from life encourages the most inspired brushstrokes and vivid colors in my work. And painting outdoors on site is pure delight.